Interested libraries in participating will have the opportunity to give information about their unique collections, services and special projects through a banner that will be displayed at the 2d level of the site. Those participating institutions will have to bring the poster to the conference premises and hand in the poster at the ACURIL Exhibit Table. Leaflets and any informational materials will be placed in a special table for the exhibit. 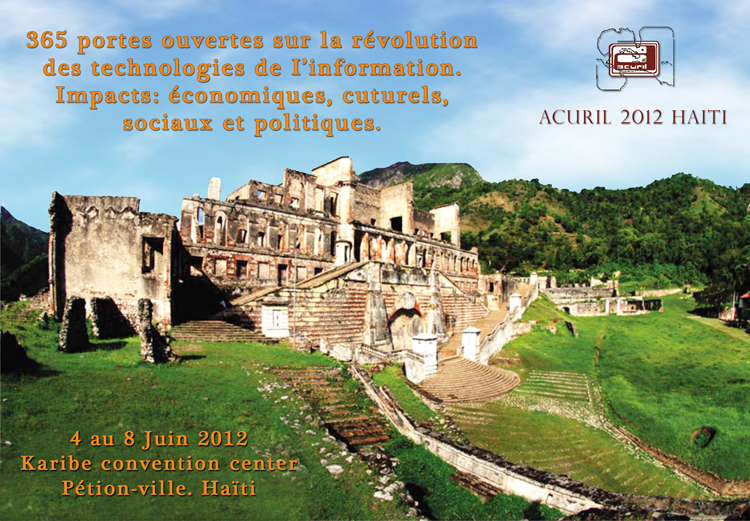 This form aims to confirm your participation at Libraries in the Caribbean Boulevard to take place within the premises of the ACURIL 2012 HAITI, at the KARIBE CONVENTION CENTER, Petion-Ville, 4-8 JUNE 2012. The first 25 participants, date stamped, will be recognized. Kindly submit the form, as soon as possible, but not later than 26 May 2012. You will have to bring the poster to be exhibited at the Convention Center.